The Agnes pearl wedding tiara perfectly captures the sliver of light that can be seen as the day transitions into night. An alluring and mystical headpiece in antique silver tones, it features candelabra details that speak to tradition, heritage and royalty. True to its name, Agnes, meaning ‘pure or holy’ is the perfect headpiece for church and formal weddings. Pair it with or without a wedding veil, this statement piece will become a beloved family heirloom. Featuring Swarovski crystals and pearls, brass components, Czech seed beads. The Agnes tiara is made to order. Please allow 4-6 weeks for production plus delivery times. 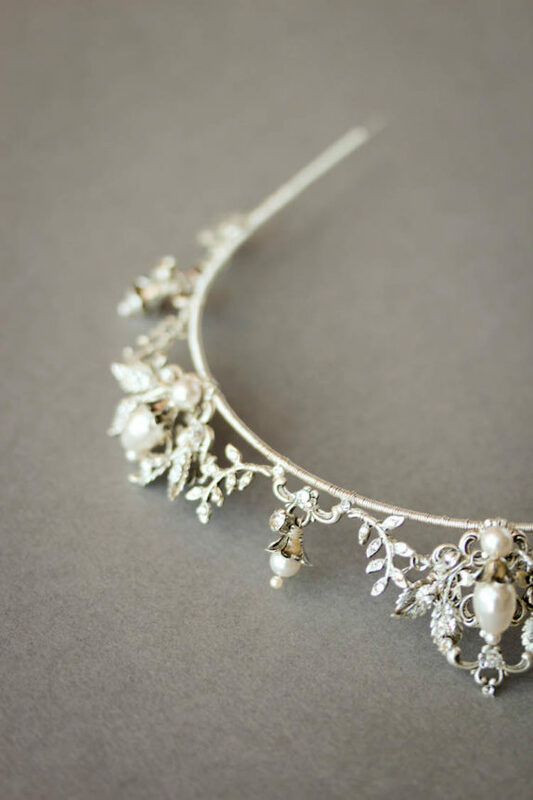 The Agnes crown is an evocative piece that’s striking, moody and ethereal. Wear it on its own or style it with a veil for a look that’s enchanting with a regal flair. Agnes can be styled with a full gathered veil or a simpler drop veil in fingertip, chapel or cathedral length. Browse our full veil collection or contact us and we’d be happy to offer a recommendation based on your wedding dress and hairstyle. We love to design our wedding crowns for wedding dresses with open necklines – including off the shoulder, low fronts, low backs and cap sleeves. It also suits long lace sleeves and high necks, depending on the gown and lace patterns. We love to style Agnes with all romantic hairstyles – loose curls, low set buns or half up hairstyles.